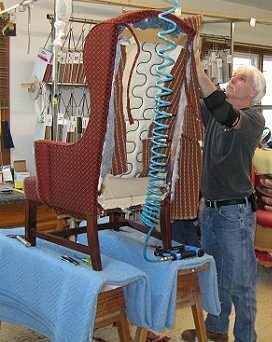 We know just how much your furniture means to you and our passion at Centennial Upholsterers is restoring it to its grandeur. Whether your furniture is an heirloom passed down from generation to generation, a favorite piece of furniture, or even a great find at an antique or consignment shop we have the experience to make it the showpiece that it should be. Our attention to detail, precise matching, and top quality materials leaves our customers delighted with our workmanship. Many often return with additional pieces and recommend Centennial Upholsterers to their family and friends. So come on in and take a look at our fabric sample books – we have many!